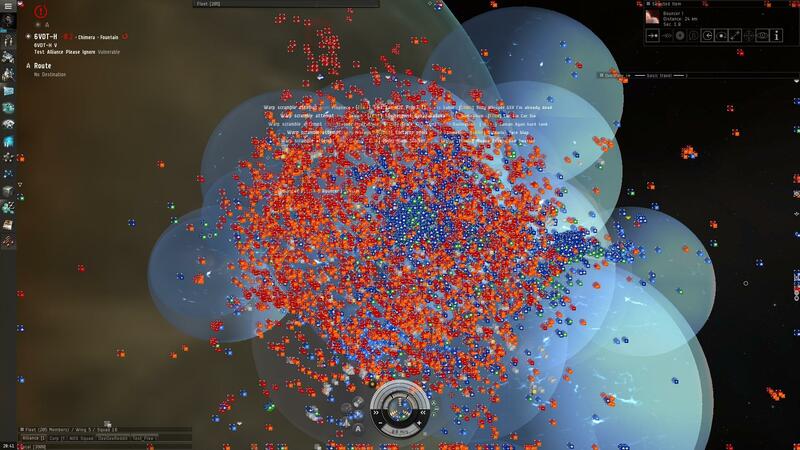 Today the spaceship MMO EVE Online, colloquially known as Spreadsheets in Space, experienced its largest battle to date, with more than four thousand individual players duking it out to the bitter end. The players of EVE Online, each controlling their own spaceship loaded with weapons or utility modules, are no strangers to fights or fleet actions, but battles on this scale are rare and usually turn into historical events that separate the newbies from the veterans. A space rumble this big isn’t all action, explosions, and heroic bravery as many sci-fi films would lead you to believe, and the fighting here looks more like a swarm of insects or a jam-packed disco dance floor (complete with lasers) than a World War II dogfight or naval engagement. What makes this fight special and EVE Online distinct from other MMOs is the scale of these completely player-driven engagements. World of Warcraft is the largest MMO to date, with some 11 million subscribers at its height, but even then those players were divided over a bunch of different servers; parallel but completely separate versions of the same world, each with around 3-4 thousand players. EVE has the entirety of its subscriber base, about five hundred thousand people, on a single server, with everyone playing in the same world. This allows for larger groupings of players and greater bouts of tension between them, resulting in massive battles like what we’ve seen today. This clash between two massive groupings of players is neat to read and look at without context, but understanding why this battle is occurring and the factors at play can tell us a lot about the game itself. It’s safe to say that while EVE has a steep learning curve and requires a massive time investment to really get going, it is one of the deepest and certainly the most dynamic MMOs out there now.